The firemen called him a "firemen's fireman." The ambulance corps referred to him as a "corpsmen's corpsman." At a testimonial dinner for him, (then) Mayor Nicholas ever said anything bad about him." An Evening Times editorial can be quoted as saying "But he was a friend to all." This barely scratches the surface of who Joe "Smokey Joe" Kennedy was. Joe was born in Sayre, raised in Sayre, educated in Sayre, and worked in Sayre. It seems that everyone in the Valley must have had some contact with Joe at one time or another. He had been a Sayre fireman, active in Engine Company No. 1 since 1937, joining when he reached the age of 21. This was a total of 37 years of service. For many years, Joe was a dormitory fireman, living in the Sayre Borough Hall, ready to answer fire calls. In addition, he was an auxiliary policeman, manning the switchboard at the borough hall during times when the regular officers were out on call. He had been with the Ambulance Corps since its beginning in 1948. During his service, he had the opportunity to assist in the birth of a number of babies who just couldn't wait for Mom to get the hospital. 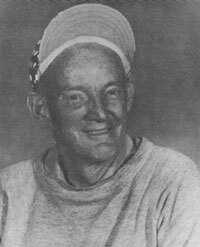 One such impatient infant was Jeff Haggerty, who made his entrance on February 2, 1950. Jeff was really impatient to see the world. He was born prematurely. Joe was on the ambulance call, and his quick actions in caring for the new baby resulted in a happy ending. At the age of 24, Jeff was present at the testimonial dinner held for Joe in March of 1974 and presented his "lifesaver" with an inscribed cup as a token of appreciation. Joe was the custodian for the Sayre Area School District, a crossing guard for Central Elementary School, a newspaper "paperboy" at the Robert Packer Hospital, a police dispatcher, caretaker for the Epiphany Cemetery and handyman shoveling sidewalks and mowing lawns for a number of residents. He worked Sayre High School athletic programs, marking the football field and working the sideline chains for all the football games. In appreciation for his dedication, he was presented with an honorary letter "S" by Sayre Superintendent of Schools, H. Austin Snyder. In 1968, he received an honorary life membership in the Pennsylvania Congress of Parents and Teachers. This was given by the Central Elementary School. If you didn't see Joe on the street, you might have seen him at the bowling alley. Joe was an avid bowler and was a member of the Sayre Firemen's League. Sayre, and the Valley, showed their appreciation for their favorite son. Joe was named "Good Citizen of the Year" by the Sayre Elks Lodge in 1970. He was presented with a life membership in the organization. In March of 1974, Joseph L. Kennedy was honored at a testimonial held at the Elks Lodge in Sayre. Congratulatory messages from Pennsylvania Governor Milton Shapp, and Representative Joseph McDade were received. Numerous gifts and plaques were given by 12 Valley organizations. It was a capacity crowd, with 350 people in attendance. After three years of ill health, Joe suffered a heart attack and died at his home on March 25, 1977. He is buried in the Tioga Point Cemetery, Athens, PA. As was befitting a dedicated volunteer, his obituary requested that memorials be directed to the Sayre Ambulance Corp.